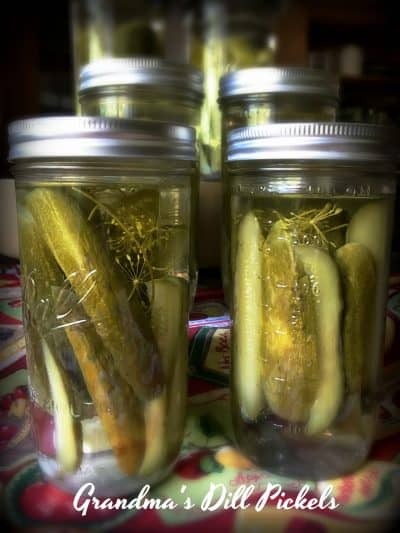 Grandma’s Dill Pickles is a fast and easy recipe for anyone but it’s an especially great recipe for the first time ‘dill pickle’ maker like me. 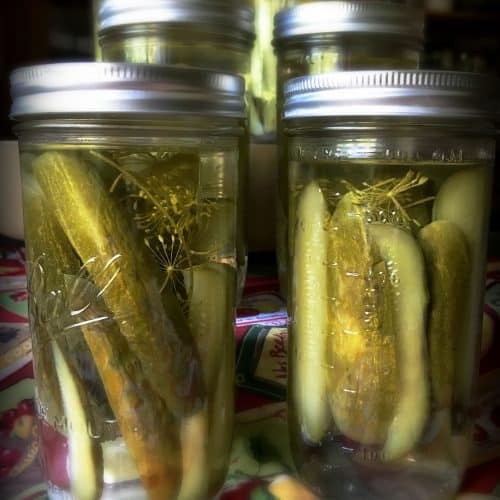 I’ve made many pickle-type recipes over the years, such as Spicy Refrigerator Pickles even a recipe for Dill Pickle Dip and Pickled Bologna but I’ve never actually ‘canned’ pickles, until today. Like most canning recipes, they are easier than you might think. I’ve learned over the years that the most important step to canning is to be organized before you begin. Before you begin, have all of your jars, lids and bands washed in hot soapy water and rinsed in hot water. You can also run the jars only, through your dish washer, this will also sterilize them. 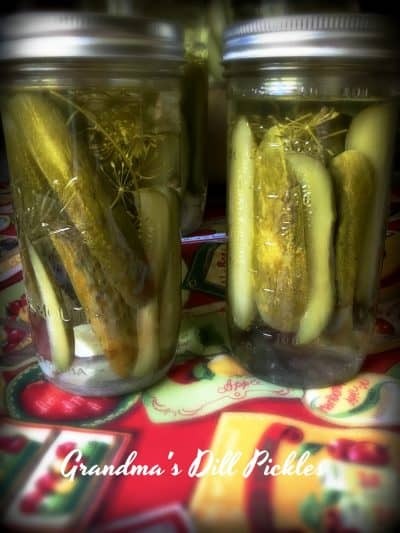 Keep them in the dish washer until your ready to fill them or follow the directions that you will find on my favorite canning site, Pick Your Own. Have your fruit or vegetables washed and patted dry. Make sure your pots, ladle, spoons, tongs and anything else you might need, are all clean. Make sure you have all of the proper ingredients and then line your ingredients up. Make sure you have a large enough pot to prepare your brine, jam/jelly or fruit pie filling etc. Have a damp cloth close by and a dry cloth. The wet cloth to wipe off the rim of the jars once filled and the other dry cloth, to wipe them off. I always seem to have a small amount of filling etc. left-over that doesn’t quite fill the jar size that I sterilized, so make sure to sterilize a few jars that are a size smaller too. Just in case! In a Dutch oven, bring water, vinegar and salt to a boil; boil for 10 minutes. 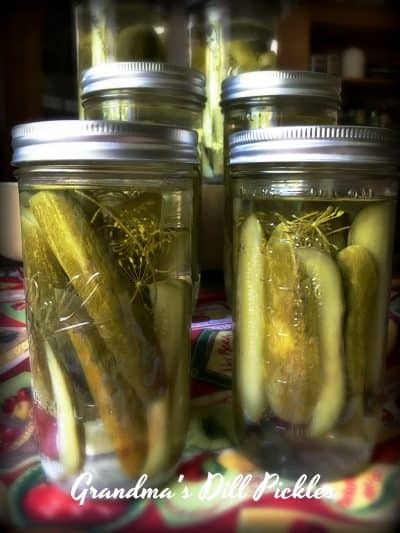 Pack cucumbers into quart jars within 1/2 inch of top. Place one dill head, two garlic cloves and two peppers in each jar. Ladle boiling liquid over cucumbers, leaving 1/4 inch headspace. Adjust caps. Process for 10 minutes in a boiling-water bath. To find recipes and for all of your canning needs, (plus so much more) go to one of our favorite websites, Pick Your Own.